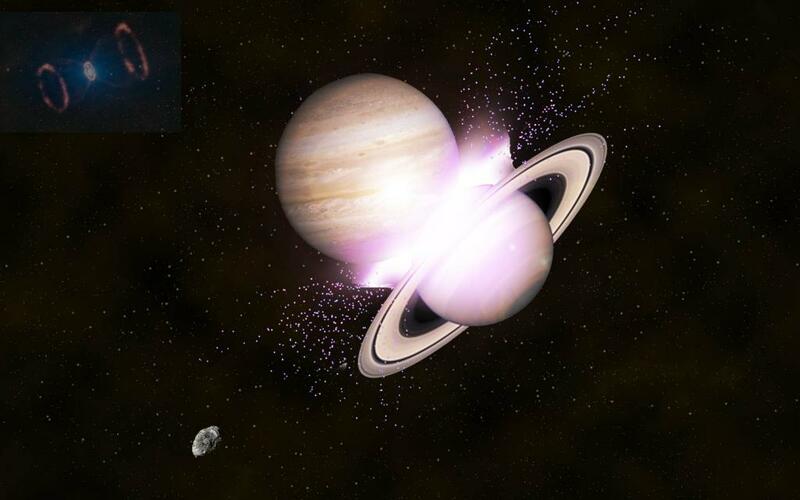 Clash of the Cosmic Titans: The forces of The Great Benefic, aka Jupiter, and The Great Malefic, aka Saturn collide when the ringed planet enters Sagittarius from September 17th, 2015 until December 21st, 2017. In order to yield the most growth from a plant, tree, or any other kind of vegetation, every competent gardener knows the act of pruning must take place. Among blossom and fruit bearing trees in particular, pruning is perceived by the non-gardening populace to be too severe or extreme. False assumptions are frequently made where the pruning process is seen as wantonly hacking or unnecessarily butchering a living thing, when in actuality, aggressively pruning a tree’s branches are the best way to cultivate its optimal growth. The theory behind the pruning process is if a tree is to continue bearing an abundance of fruit, some of its branches must be removed with a good portion of those that remain being aggressively pruned, practically to their base. In terms of evolutionary growth, Saturn can be astrologically viewed as The Master Gardener of the Cosmos, where significant transits made by the ringed planet should be viewed for those of us residing on Earth as periods of “karmic pruning”. When this occurs, the heavenly body otherwise known as “The Lord of Karma” will remove or “prune” anything considered to no longer be integral to our evolutionary growth as individuals. This particular pruning process can cause the vast majority of us to feel naked, vulnerable, and in some cases, hacked away with not much left to move forward. It is only after a decent amount of time has passed that we’re able to see how much healthier and fuller our evolutionary selves have become due to Saturn’s aggressive approach of karmic pruning. In Part I, Saturn’s upcoming 3 year transit through the sign of Sagittarius was likened to a planetary Passion Play, where the opposing influences of The Great Malefic (the ringed planet’s esoteric nickname) are soon to be merged with those of The Great Benefic, better known as Jupiter, through its ruling sign of Sagittarius. Part I also discussed how the traditional notions of anything Saturnine being seen as “all bad” and that which is Jupiterian as “all good” were being abandoned, so that a more balanced perspective could be applied to the planets which for centuries were esoterically associated with The Devil and God the Almighty, themselves. Despite Saturn’s image being transformed from the clove-footed force of restriction and pain to that of Cosmic Teacher and Cultivator, its upcoming transit through the Jupiter ruled sign of Sagittarius stands to be much more of a challenge to the world at large than any of the ringed planet’s other treks through the Zodiac. Why? Cosmic classes are about to commence where The Great Malefic’s teaching techniques of harnessing a disciplined work ethic and learning lessons the hard way will be imparted via a sign whose planetary mentor regularly utilizes the fortuitous forces of Luck, Fortune, and Good Timing. The Planetary Passion Play now shifts from being a cosmic clash between The Devil Incarnate and the Almighty Benefactor to that of a karmic collision between the universal Task Master and the Solar System’s most Indulgently Spoiled Student. If Saturn is the planet of karmic debt, Sagittarius is the sign of karmic credit. Where Saturn sees the glass as half empty, Sagittarius sees that same glass as half full. Whereas the Sagittarius relies on their Luck, Saturn negates it through solitary and strict reliance to an ethic of hard work. Blending the Lord of Karma’s sobering influences and teaching tools of difficulty and challenge with a sign associated for its exceptional good Luck and blessed bounty doesn’t lend to Saturn’s upcoming transit through Sagittarius being a period of time marked by relative ease and gradual change. Rather, mixing the energies of The Great Malefic with the sign ruled by The Great Benefic foretell of society having to face juxtaposing forces of change that will be either explosively last minute or very much long needed. In turn, these changes will most likely be applied in altering people, places, or things of an unmonitored or excessive nature through the processes of either restriction, loss, or structured regulation. The above is made evident in the final part of this series, when the Planetary Passion Play culminates with Brad Kronen’s predictions for a particular industry which combines Saturn’s area of “Work” with Sagittarius’ Luck factor. ***Brad Kronen’s latest book, “Love In The Stars” published by Llewelyn Worldwide, Inc. is now available for pre-order via Amazon.com.